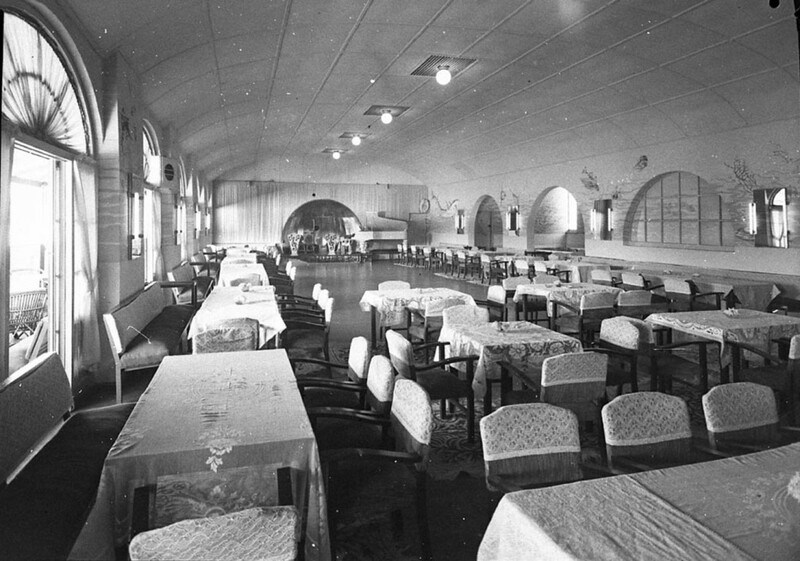 From Album: 'Pasadena waterside restaurant, Church Point (taken for Mr Teasdale-Smith), 1950' by Sam Hood. Images No: Home and Away - hood_11654h (top) hood_11650h and hood_11652h (below) - courtesy State Library of NSW. 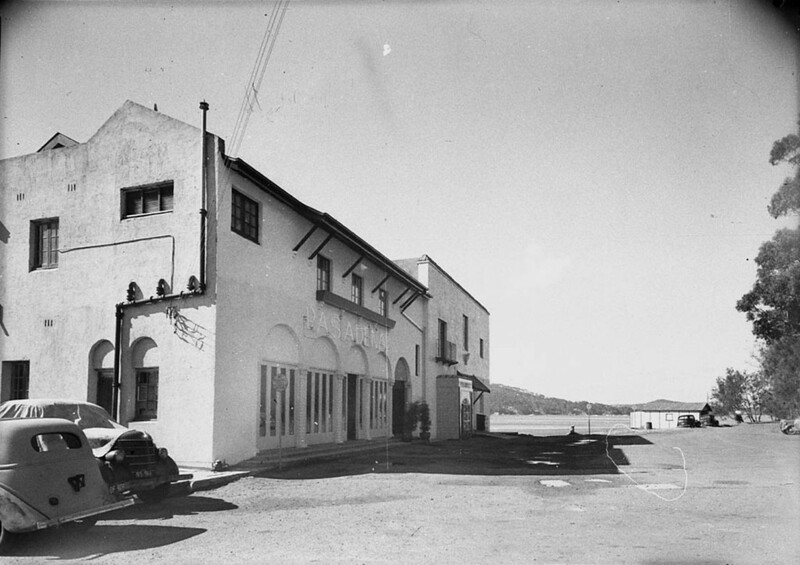 Given several names throughout its operating days, the 'Pasadena Roadhouse', 'Pasadena Motel', 'Pasadena Lodge Motel', 'Pasadena Club', 'Pasadena Cabaret', as well as 'Pasadena on Pittwater' and being a community hub under the auspices of the Gone Fishing Galleryj ust prior to being placed on the market, this structure, unlike The Rock Lily and Barrenjoey House, has changed a few times during its decades as part of our community. 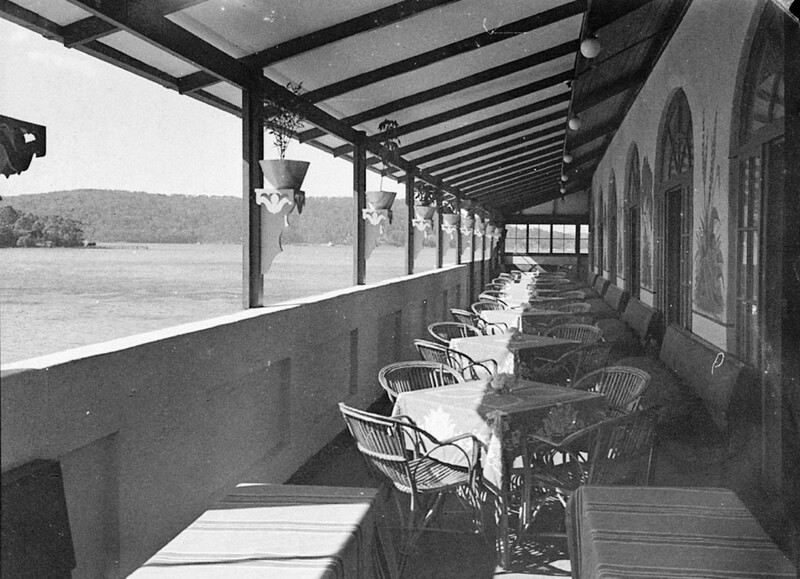 Structural changes from simple boathouses to concrete facades, some to meet an expanding clientele for a popular resort, have not changed the peace and quiet and sense of grandeur any visitor to this tucked away idyll of Pittwater senses when standing on the foreshores of Church Point and gazing towards the Ku-Ring-Gai park and all that bushland. 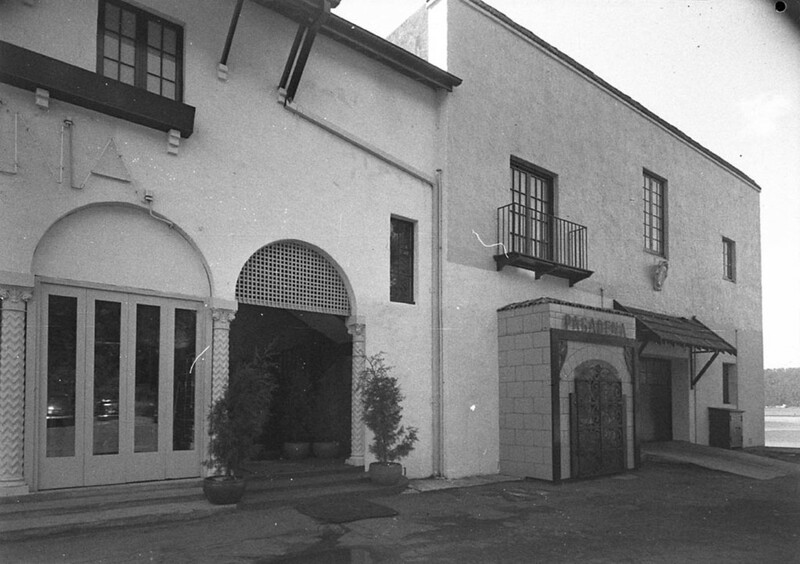 Prior to the opening of the first version of the Pasadena camping and cottages, some advertising themselves as boarding houses, provided visitors to the area with a wide range of places to stay and even, in the La Corniche of Bayview, proprietor Mr H Rainaud, a restaurant that was travelled to for luncheon. The land itself was owned by Benjamin James 'the younger', who held 23 acres (part of Portion 25) on the point at the entrance to McCarrs Creek. In 1885 he applied to purchase reclaimed land in front of his property. This portion encompassed what would become the Pasadena Roadhouse and Church Point Reserve. An application to Warringah Shire Council to build accommodation closer to the Church Point Wharf appears in 1904 when James Booth, at the fairly new formed shire, records in its 13th meeting of the 22nd of February a request to 'erect a motor car shed in an excavation at Church Point'. In 1908 Mr. Booth requests permission to use this shed as a dining room, which is refused as it may impact on neighbours. Simpsons at Church Point, c. 31/12/1908, from State Records NSW pictures, Item No. : 18526_a024_000026. As at Palm Beach, Church Point attracted a lot of ex-servicemen after World War I. The next gentleman to take over the store and post office from Mr. Simpson being Alfred Ernest Burton (Ex-A.I.F), buying Simpson's business and 'holdings' at Church Point. Simpson's Estate was advertised for sale from early 1921 - see Sale Notice in Extras below. In 1922 A E Burton., states his son, who had been performing the duties, has left the district and Thomas Wilson was temporary post-master. This may indicate that a father bought a 'holding' for a son returned home damaged during a time when men and women were expected to come home from war and 'get on with it'. A E Burton's War Record reads, like all war records, as a nightmare. He enlisted on August 6th, 1915, when 21, legally able to, and possibly in the heat of reports filtering through of the Gallipoli massacres. on February 16th, 1916, he was landed in Tel-el-Kabir, training centre for the First Australian Imperial Force reinforcements, Egypt, and by August 1916 was in Boulogne, France. Throughout his records are incidents of poor health, and being admitted with Influenza in January 1917, a flu that killed hundreds of thousands of people post WWI. He is finally discharged from London in August 1918 'in poor health - poor physique'. He had been an Electrical Engineer prior to enlistment and married to a Clarissa Burton. On December 1st 1922, Stanley Raymond Hummerston, another Returned Soldier, took over the business. Assigned to the 26/7th Light Horse Regiment during WWI as is previous occupation had been Horse Driver, Mr. Hummerston was a Woolloomooloo gentleman with a tattoo of a butterfly on his left forearm, a man on a horse on his right forearm, and tattoos across his chest and shoulders that weren't described. He enlisted at age 24 on February 1917 and was sent to Moascar Isolation Camp (many soldiers were arriving from Australia with measles and other diseases) and on to El Fukhari. His records indicate he too frequently was returned to Moascar Isolation Camp with one illness after another. When we spoke to Henry MacPhillamy a few years ago, he iterated that many men serving in New Guinea in WWII died from disease and pest related bites, in some areas more died from these than battles. Mr Hummerston was returned to Australia in 1919 finally discharged on the 16th of April, 1919. He too may have struggled with 'just get on with it'. In November 1924 a retired Bank Manager for Bank of NSW, then 69, Alan Gardner Fyers Mann took over the business and had one Agnes Jensen, wife of the Church Point Ferries of then, run the Post Office and store for him. A.G.F. Mann held the Special Lease on a Store and Refreshment Room and on 22/4/1925 Warringah Shire records show an application for an additional Special Lease to expand the same - Council Resolved to send an Inspector to report on the state of this building and others along the foreshores at Church Point as they apparently all looked a bit worse for wear. His application was refused. From: NAA SP32/1, CHURCH POINT PART 2 - Church Point Post Office file (1913 - 1964) [Box 163] - National Archives of Australia. His efforts to rebuild were delayed by a Timber Workers strike. Both The Post Office Master General and Warringah Council made several inquries during 1929 as to when this would occur, and although he had contractors to rebuild, at a cost of £2000, and furnished a drawing, Charles Frederick Wymark, filled the gap as Post Master. Records indicate that Mr. Fitzpatrick moved his family to a rural setting at this time, for work, and also for health reasons. 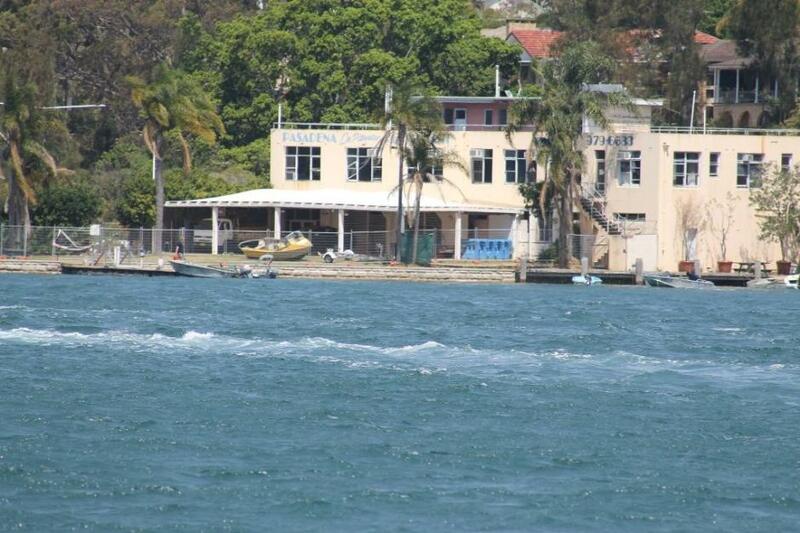 Although he continued to have large holdings in Pittwater, particularly in the nooks he loved so much, Church Point, Elvina Bay and Scotland Island, it is Charles Wymark, only son of the wonderful Frederick Wymark, who seems to have moved into Church Point in a big way. Church Point in the Roaring 1920's attracted visitors day and night. There is accommodation listed in association with the cafe and 'refreshment room', but only a residence, a few rooms. 48. Local Government Dept. 25.2.30. Advising the Council that Residential District Nd. .2 (Bayview and Church Point) was proclaimed in the Government Gazette as of 14th ult. CHARITABLY MINDED night-club proprietors are still something of a novelty so we don't mind mentioning Mr. Teasdale Smith, who has taken over the Pasadena Roadhouse at Church Point. He plans to put on special shows for nominated charities about twice a month. Chas. Wymark 13/11/35, applying for permission to erect a sign, with the word. "Pasadena", in Mona Vale Park at the intersection of Bayview and Newport Roads. Resolved, - That the Works Committee report on this matter, and Mr. Wymark be invited to meet the Committee. Radiant Signs Ltd, 11/12/35, regarding permission given to Mr. Wymark to erect a sign at Kitchener Park, Mona Vale, asking that the sign be a Neon sign 81 x I', with the words "Pasadena Roadhouse" thereon. - Application was agreed to. APPLICATIONS FOR LEASES FOR SPECIAL PURPOSES. THE undermentioned applications have been received for Special Leases of the lands and for the purposes hereunder stated. It is the intention to grant leases should no sufficient objection be found to exist, after inquiry by the Land Board and consideration by the Minister. Any objections will receive due consideration if lodged in writing with the District Surveyor for the Land Board District in which the land is situated, on or before the date hereunder specified. E. A. BUTTENSHAW, Minister for Lands. APPLICATION FOB LEASE FOR SPECIAL PURPOSE. THE undermentioned application has been received for Special Lease of the land and for the purposes hereunder stated. It is the intention to grant the lease should' no sufficient objection be found to exist after inquiry by the Local Land Board and consideration by the Minister. Any objection will receive due consideration if lodged in writing with the District Suryeyor for the Land Board District in which the land is situated. F. H. HAWKINS, Minister for Lands. Parish Narrabeen, county Cumberland; Special Lease No, 55-7, Land District Metropolitan, for boatshed, wharf and slip. Land applied for—26 perches below high-water mark of Pittwater at Church Point. Applicant—Charles Frederick Wymark. 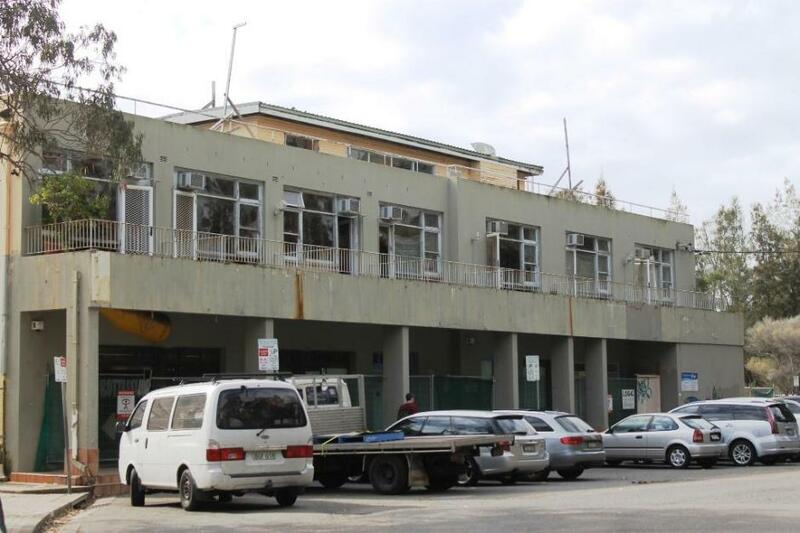 Objections may be lodged at Land Board Office, Sydney. THE undermentioned application has been received for special lease of the lands and for the purpose hereunder stated. It is the intention to grant the lease should no Sufficient objection be found to exist after inquiry by the Local Land Board and consideration by the Minister. Any objection will receive due consideration if lodged in writing with the District Surveyor for the Land Board district in which the land is situated. J. M. A. McMAHON, Minister for Lands. Parish Narrabeen, county Cumberland; Special Lease No. 57-2, Land District Metropolitan, for boatshed. Land applied for, 10 1/2 perches below high-water mark of Pittwater at Church Point, being portion 4^ shown on plan Ms. 8,048 Sy. Applicant, Charles Frederick Wymark. Objections may be lodged at Land Board Office, Sydney. Church Point Wharf was a visiting point for steamers from at least the 1860's. The Hawkesbury River Steam Navigation Company denying that one of their steamers had damaged the Church point Wharf during the earliest Warringah Shire Council Meetings records predates a Church point Ferry Service by three decades. Other articles state the steamer would arrive around 9 p.m. on a Friday night, bringing everyone down to the wharf to offload goods and load produce for the Sydney markets. Once a road into Church Point was built the coach lines and then Mr. Bottles Motor Bus followed by those who could afford a motor car brought more and more visitors to Church Point. The boon in 'motor car touring' brings some lovely early images of Church Point through such reports and always featured as one of the picturesque drives to take when going on a 'motor tour'. Above from: Narrabeen Lakes Estate, 1906 / Arthur Rickard & Co. Ltd Auctioneers. 1906. MAP Folder 114, LFSP 1695 (Copy 1). Part 17. Courtesy National Library of Australia. Seafood and fresh farm fare was the specialty of Pittwater in its early days, from the reports of falling into the Pittwater while seeking oysters in My Holiday by Charles de Boos - 1861, right through to the sought after 'Newport Oysters', and numerous fishing reports of all caught at Church Point, fish as fresh as the morning were available and listed as fare and as a sport among the attractions to potential excursionists brought by their thousands in steamers (also here). Apparently many came here just to fish and many on these steamers went home with good catches. Visitors planning to spend any time here as campers or boarders were advised most of what they need could be bought here or easily caught, and to only bring essentials, see: A TRIP TO BROKEN BAY (1873) By a Freshwater Sailor. From Bayview the road, a very good one, winds around the beach, disclosing as every vantage point is gained new beauties of land and water. Around here are some very good orchards, with trees laden with fruit, and the homesteads peeping out from masses of evergreen foliage, with an extensive vista of land and water. In a charming spot on a sloping hillside, with such a fore-ground and a craggy background Professor Anderson Stuart has a summer residence and orchard. Mr. W. G. Geddis has a neat residence on a pleasant point. Mr. W. Baker has an orchard with some magnificent trees, while on a commanding bluff is Mr. John Poster's residence and orchard. Mr. A. McIntosh's residence is also hard by. The chefs who concocted menus at the Pasadena presented a la carte meals. 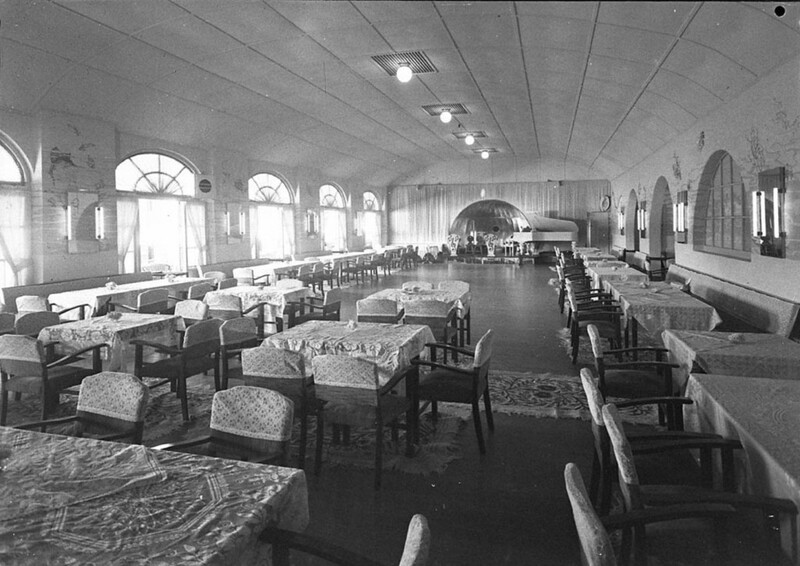 In the 1950's afternoon teas were available and dinners for Cabaret shows. Reginald Lee, as shown in article below, was one of the first chefs at the Pasadena and a nod towards the Wymark's enjoying the best food available in Sydney prior to their Church point days. The Fare, it seems, was the best from the outset. Spanish and Russian songs sung by the Russian tenor, Mr. Charles Niels, were wafted out on the breeze over moonlit, waters at Church Point on Saturday night, when a dance, organised by Commander Gifford, was held at Pasadena, Church Point, and as a result £40 was added to the funds of the Royal Prince Alfred Hospital. The Pasadena, under Charles Wymark and all proprietors who followed, has always been imbued with community spirit. CALALOU-a spicy Creole dish concocted from pickled pork, fish, shrimps, and sago and made through-out the islands of the West Indies-will be served at the "Caribbean Night" party being organised by the Collaroy branch of Torchbearers for Legacy at Pasadena Roadhouse, Church Point, tomorrow. Ingredients: 1 ½ lb salt or pickled pork. 6 onions (chopped). 2 lb spinach leaves (chopped), 1 lb fish (chopped), 1 lb shrimps or prawns, or 3 or 4 small sand crabs, 1 lb okra or, alternatively, sago. Clove garlic. 1 tspn. marjoram. 2 or 3 fresh red chillies (chopped), 1 tspn. cumin.1 quart water. Widow Keeps "Dream Boat" Going. Mrs. Grace Roberts is determined to do everything she can to keep her husband's water-taxi running at Church Point. Mrs. Roberts lost her husband and baby in tragic circumstances. The baby, Michael, aged17 months, fell overboard from the water-taxi on August 11 and her husband, Bill, was drowned trying to save him. At her little cottage at Lovett Bay Mrs. Roberts said yesterday: "Bill's boat was his dream-his ideal. "He slaved from six in the morning until late at night to build up the taxi service; It was more than just a business proposition. Perhaps because we are so cut off down here, there is a strong community feeling among us. Bill liked to feel he was helping to build that feeling by being willing at any time and in anyway to help people. I couldn't bear to see the boat idle," added Mrs. Roberts, as we watched the water-taxi cut a clear line across Pittwater towards us. It was against all Bill's principles that people here should be left stranded." In Barrenjoey House being able to have a drink with your meal clearly occupied any proprietors thoughts. What created the 'six o'clock swill' in Australia, which was started during WWI when licensed premises had to close their doors by 6 p.m. due to a push towards austerity, and compounded by a soldiers riot in 1916 in which one man was shot at Central station, became a matter to be addressed once more as WWII ended. Viewed as a semi-prohibition, with Tasmania the first to change the law so hotels could stay open until 10 p.m., but not on a Sunday - even into the 1970's, in NSW it was not until 1954 that this law was changed to catch up with Tasmania and 1955 before the 10 p.m. closing time began. In 1958 Charles Wymark is renovating his holdings at Church Point again. The structures facade and interior is changed but the name stays the same. In 1960 John Hackett and Ray Berne with their four children, Cheryl, Joneen, Gai and Tom take over the Pasadena in 1960. The building has a general store and newsagency with a ballroom upstairs. The family resides in a flat at the back of the store. In 1971 William Douglas McWhirter of Hunters Hill and Philip John Beacroft of Epping become the new owners. During the late 1980's a kitchen garden with herbs supplemented the fresh produce being delivered to the Pasadena. 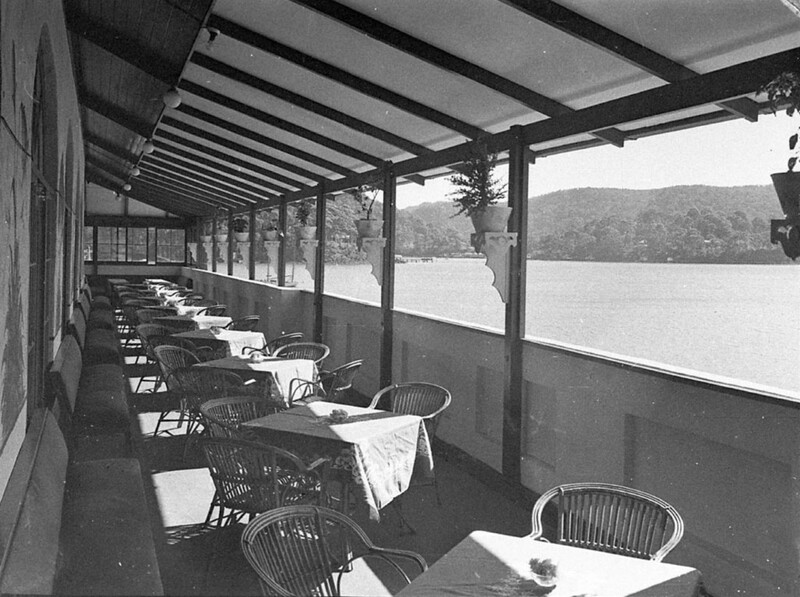 The kitchen, large and commodious, was to the right of the dining room, which was tiled and opened out to the front of the building to give diners a wonderful view of Pittwater, while the rooms were upstairs. 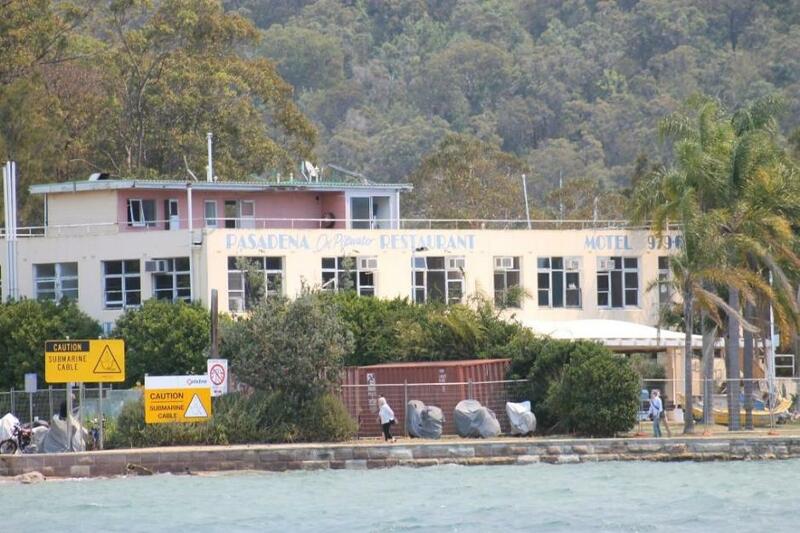 In 2000 the 'Pasadena on Pittwater' in restaurant and travel guides lists 14 rooms upstairs at $75.00 per night. In 2002 a planned redevelopment which was "to demolish the existing building and erect a four-storey mixed residential development containing nine residential units and basement car parking" and objected strongly to by the community was subsequently approved on Friday 12 January 2007 by the Land and Environment Court, objected to again, plans changed and.... then nothing happened. Owners, the Romeo Family ran a very popular restaurant and rooms to stay in, listed as '12 motel rooms with ensuites' on the upper floor in 2012. 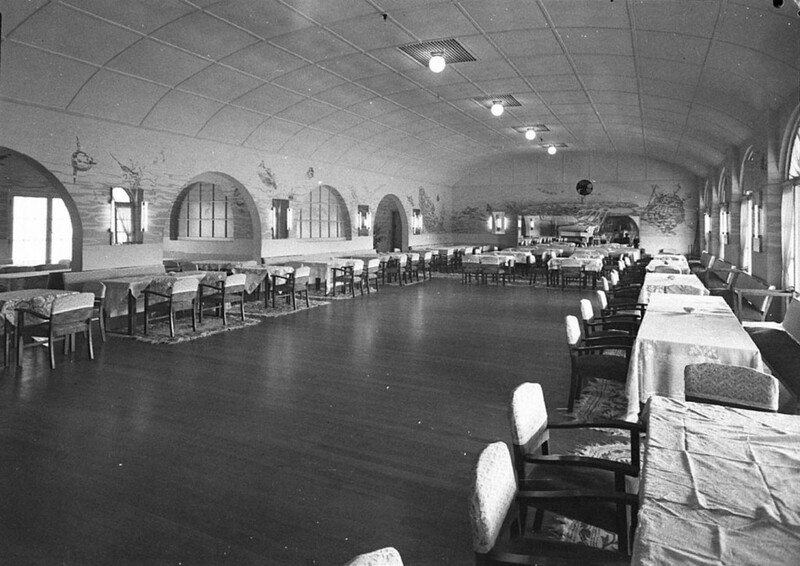 The ground floor still had a large open restaurant, commercial kitchen and bar. The top floor had a laundry and open terrace. The wonderful artist-run Gone Fishing Gallery occupied the spaces, although it leaked when it rained, until the sale to two gentlemen in 2012. 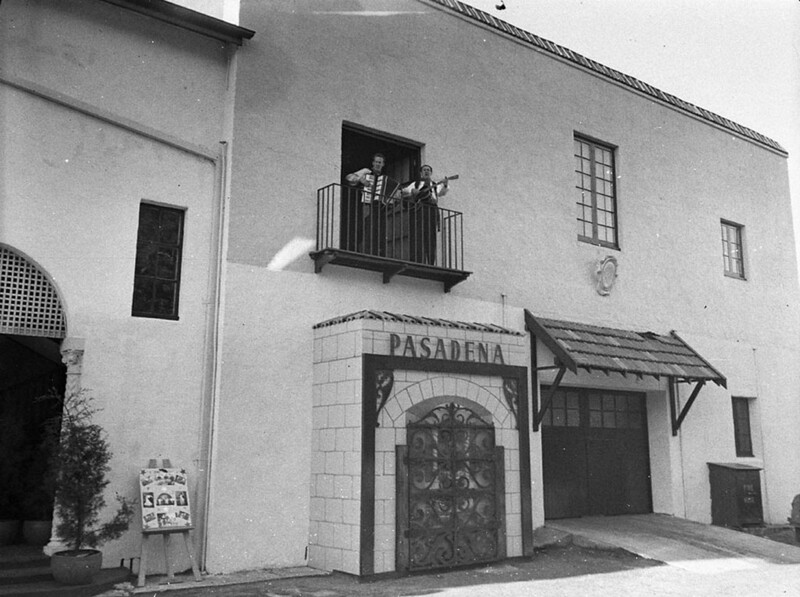 Pasadena in California was a winter haven for wealthy people during the 1920's, a tourist attraction. It was recognised as an affluent suburb, surrounded by citrus groves... a peaceful and beautiful landscape surrounded by hills and mountains. A California Bungalow architectural phase was to influence Australian building throughout the 1930's, Avalon Beach had many such houses of this style built then. So it may simply be the similarities, and a local knowledge that getting people to visit in Summer was easy, Winter a whole other matter. An association technique that worked well at Palm Beach where land sales were poor prior to associating this idyll with a name of affluence once again in the US of A. Church Point is still around 20 miles from Sydney and still thousands of miles from such noise and rush. The Pasadena, octogenarian and still present, may yet shake off the shackles of fences and boards, rise and waltz off across the ballroom of a teal estuary and send laughter, and the smell of great food, up into the hills which surround her. This lovely spot may be reached by the motorist in about three-quarters of an hour from Sydney. It is part of Pittwater, just beyond Church Point, and is known to sailing men as McGarr's Creek. Many motorists who go to Church Point are unaware of the fact that the road— somewhat narrow, but with passing places here and there — running up the hill to the beautiful scene here pictured may safely be taken. I will write and tell you about a delightful holiday Flo and I had a few weeks ago. We had grown rather tired of the Mountains, and thought a seaside place would be a change, so at last we decided on Pittwater. We started one Friday afternoon, and, catching the 3 o'clock boat to Manly, reached it in plenty of time for the Pittwater coach, which left Manly shortly after4 o'clock, and arrived at Pittwater in time for dinner. Although we had a 12 miles' drive by each, still we did not find it a tiresome one, for the road was good all the way ; besides, the scenery was so beautiful. All along the route there was something interesting to look at. Now we were passing through a forest of tall trees and beautiful cabbage-tree palms, and wildflowers growing in great profusion ; and then suddenly we were confronted In all its grandeur by the ocean itself. And soon we drove, until Church Point, which is as far as the coach goes, was reached, and we found ourselves on the shores of Pittwater. We had made arrangements beforehand as to that coach we would come down by, so we weren't surprised on leaving the coach to find a small motor launch waiting to convey us to our destination. After about 10 minutes in the launch we entered a pretty little bay surrounded almost by mountains, and picturesquely situated on the side of one of these was the cottage which was to be our abode for the next ten days. Benjamin and Harriet James (nee Murday - mother Frances): two daughters and two sons: John (born 1843) Benjamin (born 1845) Mary S (born 1847) and Frances A (born 1851). Department of Lands, Sydney. June 1, 1885. The Late Mr. Benjamin James. AMONG our obituary notices yesterday morning was the well known name of Mr Benjamin James, who died after a painful illness at the age of 69. Mr James had been in failing health for many months and often dining the last year the members of his family had gathered round what they feared at that time, would be his death-bed. With the stubborn activity, however, that had distinguished him in the prime of life he bore up towards its clono against the warnings of ago and the threatenings of disease. Six weeks ago alarming symptoms were manifest, and from then until his death shortly before midnight on Sunday he gradually sank. A colonist of 42 years' standing, Mr. James had identified himself with the early welfare of the city, and took a warm and active interest in every movement that promised to advance, his adopted colony, His public life, commencing with the anti-transportation movement, and continuing through all the stages of reform that has produced our present social happiness, ended with the loss of health, made attention to business intermittent and at best uncertain. Sudden Death of Mr. Ben James. Mr. Benjamin James, who was widely known in commercial and political circles in New South Wales, died suddenly in Sydney. Mr. James was educated at schools in Sydney, Hobart, and elsewhere. For many years he was in partnership with Mr. Parker in the grocery business, the firm being known as Parker and James. Subsequently Mr. James became a real estate and commission agent, and was engaged in that business for many years. GOVERNOR PHILIP Speared by Aboriginal. MONUMENT UNVEILED. On September 7, 1790, Governor Phillip, while visiting some aborigines near Manly, was seriously wounded by one of the natives plunging a spear into his shoulder. On Sat-urday a monument erected to commemorate the Incident was unveiled by the Minister for Health (Mr. Marr) at Collins Flat, within the quarantine area, at the invitation of the Manly-Warringah-Pittwater Historical Society. The visitors, who included Mr. Aubrey Halloran, a past-president of the Royal Historical Society of Sydney, and the Mayor of Manly(Alderman J. H. Cross) were welcomed by the president of the society (Mr. M. J. Lowe). Fairly complete accounts of the attack on the Governor have been preserved. From these it appears that Lieutenant Nepeanwhile going to Pittwater, encountered about a couple of hundred aborgines in a cove near Manly, feasting on a whale which had been washed ashore. As they were very friendly, he sent word back to the Governor acquainting him of the gathering, and next day the Governor, accompanied by Judge-Advocate Collins and Lieutenant Waterhouse, went down the harbour to visit the natives. They found on arrival that among the aborigines was the man Benelong, whom the Governor had known for some time. The Governor was well received, and walked unarmed about among the aborigines. On being told by Benelong that a friend of his wanted to be taken notice of, the Governor advanced towards the man holding out his hand. The fellow, however, drew back and, poising his spear, drove the weapon at the Governor, wounding him very severely. Particulars of the incident are given by T. B. Barton, and in the Macarthur Papers and in diaries and letters of the time. A painting in which Lieutenant Waterhouse is shown trying to break the spear after the Governor fell, hangs in the British Museum. A copy is in the Mitchell Library. In unveiling the monument, Mr Marr congratulated the society on the admirable work it was performing in marking spots of historic interest in the district. Succeeding generations, he said, were very prone to forget men of an earlier day, and it was well to have reminders of events in the history of New South Wales, particularly of those with which the name of Phillip was associated. Mr. Aubrey Halloran said it would be a good thing if people who spoke despairingly about Australia nowadays would remember Phillip's example and faith in the hour of trial – and then perhaps they would realise what wonderful times they really lived in. OBITUARY. MR. F. S. SHENSTONE. The esteem in which Mr. F. S. Shenstone had been held by members of the publishing and golfing sections of the community was shown by the large number who attended his funeral, which took place yesterday at the Church of England cemetery, Rookwood. Mr. Shenstone was secretary of Angus and Robertson, Ltd., and supervised most of their publishing work. He was born In Rutherglen, Victoria, in 1876, and came to Sydney when a child. He was educated at Newington College, and entered the service of Angus and Robertson, Ltd., when 18 years of age. Mr. Shenstone was a keen golfer, and was last year captain of the Bonnie Doon Golf Club. Mr. C. E. W. Bean, the war historian, paid a fine tribute to Mr. Shenstone when his death was announced. He said that Mr. Shenstone's services in the publication of the volumes of the war had been invaluable, and that in his efforts to assist in the work, Mr. Shenstone was indefatigable. COSMOLOGY. UNIFIED FIELD. Einstein's New Theory. VANCOUVER, Feb. 4. A report from Pasadena, California, says that Professor Albert Einstein astounded world-famous astronomers at Mount Wilson Laboratory to-day in his first announcement of a new cosmology, resulting from his unified field theory. "The old symmetrical spherical space theory is not possible under the new equations," Professor Einstein said, in a closing talk explaining his unified field theory. Bayview and Church Point Progress Association.. 1/6/28; Requesting that notices be erected on the roadside at Bayview requiring campers to burn or bury, their rubbish. Resolved '' (Cr5. Hitchcock,Hope) That two notices be erected as requested. Lovett Bay, Pittwater. A charming inlet in the Ku-ring-gai Chase, which may, be reached by motor launches, to be hired at Newport, Bay View, or Church Point. Lovett’s Bay THE BEAUTIFUL SHIRE OF WARRINGAH. MONA VALE BEACHES, With rock-bath shown in left-centre of picture. A regular hourly service of motor 'buses takes 'trippers' to this beach. The Pretty Little Curl Curl Beach, With a part of Manly showing in the distance. Picturesque Narrabeen. The lower lake and bridges. Narrabeen has become wonderfully popular in recent years. It is easily accessible, and its charms are all-appealing. The Ever-popular Freshwater Beach on an 'Off' Day. This beach is said to be the safest on the coast. Above: Pasadena - taken from Pittwater Estuary 2012. Below: Pasadena in August 2014 - coloured images this page by A J Guesdon 2011 to 2015. 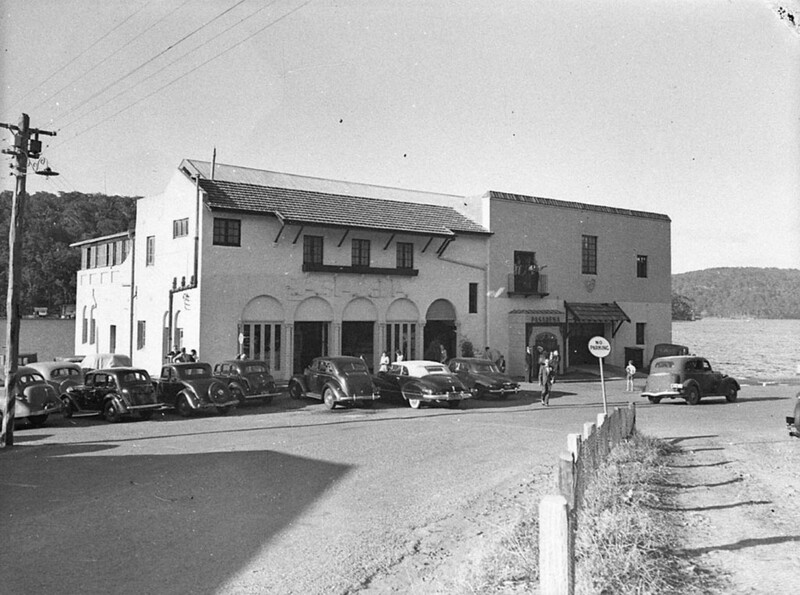 The Pasadena Road House, Motel, Club, Cabaret and Pasadena on Pittwater at Church Point - Restaurants You Could Also Stay In Part I - threads collected and collated by A J Guesdon, 2015.